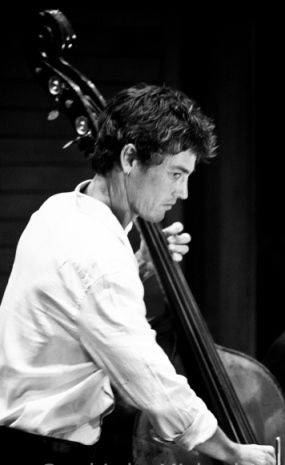 Andrew Shaw is a much in demand bassist who has performed in many of Australia’s leading jazz venues and festivals, as well as recording extensively. Andrew’s background encompasses a diverse range of styles, mostly in more contemporary music. Nevertheless his ensemble playing style is highly compatible with the CSJB’s mus ic and lends much drive to the rhythm section. His exceptional technique allows him to effortlessly produce solos that while being technically masterful, remain faithful to the rhythmic and melodic elements of the CSJB’s jazz idiom. One critic has described Andrew’s style as “..at once musical and muscular”. Andrew has worked with such high profile artists as James Morrison, Grace Knight, former Miles Davis side-men Dave Liebman and John Scofield, pianist Mike Nock, former Jazz Messenger saxophonist Dale Barlow, Verve recording artist Mark Sholtez, pop and cabaret stars Mandy Patinkin, Patti Lupone, Lea DeLaria, Sarah Blasko, and Rhonda Birchmore and the Queensland Philharmonic Orchestra. He has performed with many of Australia’s finest jazz musicians such as Jim Kelly, Jeff Usher, James Ryan, Roger Manins, Jacam Manricks, Toby Wren, Jamie Oehlers, David Bentley, James Sherlock, Kristin Berardi, Megan Washington, Jo Fabro, Vince Genova, Adrian Cunningham, Matt Baker, Ingrid James and many more. Andrew served on the Advisory and Management Committees of Jazz Queensland from 1996 to 2011, including 5 years as President/Chairperson. 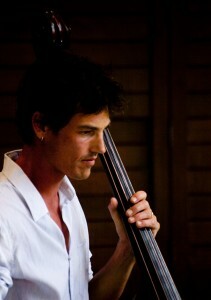 He was the founder and driving force behind the Valley Jazz Festival presented by Jazz Queensland. He served as Artistic Director in 2004, 2005, 2007, 2009 and 2011. Andrew commenced with the CSJB in October 2010, and has effortlessly slotted into the band. His exceptional skills on the bass together with his creativity, personality, relative youth and good looks are indeed assets to the band.